Our research, published today in Nature Communications, uncovers one such volcanic lie. Accurate dating of prehistoric eruptions is important as it allows scientists to correlate them with other records, such as large earthquakes, Antarctic ice cores, historical events like Mediterranean civilisation milestones, and climatic events like the Little Ice Age. This gives us a better understanding of the links between volcanism and the natural and cultural environment. Lake Taupo, in the North Island of New Zealand, is a globally significant caldera supervolcano. The caldera formed after the collapse of a magma chamber roof following a massive eruption more than 20,000 years ago. Now it seems that the Taupo eruption that occurred in the early part of the first millennium has been lying about its age. But like many lies, it was eventually found out, and it reveals exciting processes we hadn’t understood before. The eruption of Taupo in the first millennium has been dated many times with radiocarbon, yielding a surprisingly large spread of ages between 36CE and 538CE. Radiocarbon dating of organic material is based on the concentrations of radioactive carbon-14 in a sample remaining after the organisms’ death. Over the past two decades, the method has been refined greatly by combining it with dendrochronology, the study of the environmental effects on the width of tree rings through time. Radiocarbon dating of tree ring records has allowed scientists to construct a reliable record of the concentration of carbon-14 in the atmosphere through time. In principle, this composite record allows eruptions to be dated by matching the wiggly trace of carbon-14 in a tree killed by an eruption to the wiggly trace of atmospheric carbon-14 from the reference curve (“wiggle-match” dating). Scientists presently use wiggle-match dating as the method of choice for eruption dating, but the technique is not valid if carbon dioxide gas from the volcano is affecting a tree’s version of the wiggle. Our study re-analysed the large series of radiocarbon dates for the Taupo eruption and found that the oldest dates were closest to the volcano vent. The dates were progressively younger the farther away they were. This unusual geographic pattern has been documented very close (i.e. less than a kilometre) to volcanic vents before, but never on the scale of tens of kilometres. Two wiggle match ages, taken from the same forest, located about 30km from the caldera lake, were among the oldest dates from the series of dates. This enlarged influence of the volcano can be explained by the influence of groundwater beneath the lake and its surroundings. The Taupo wiggle-match tree grew in a dense forest in a swampy valley where volcanic carbon dioxide was seeping out of the ground and was incorporated in the trees. The ratio of carbon-13 to carbon-12 (the two stable isotopes of carbon) in the modern water of Lake Taupo and the Waikato River tells us that volcanic carbon dioxide is getting into the groundwater from an underlying magma body. Can large eruptions be forecast over decades? Our study shows that a large and increasing volume of carbon dioxide gas containing these stable isotopes was emitted from deep below the prehistoric Taupo volcano. It was then redistributed by the region’s huge groundwater system, ultimately becoming incorporated into the wood of the dated trees. The increase was sufficiently large over several decades to dramatically alter the ratios of different carbon isotopes in the tree wood. The forest was subsequently killed by the last part of the Taupo eruption series. But the dilution of atmospheric carbon-14 by volcanic carbon made the radiocarbon dates for tree material from the Taupo eruption appear somewhere between 40 and 300 years too old. The precursory change in carbon ratios gives us a way to gain insight into the forecasting of future eruptions, a central goal in volcanology. We found that the radiocarbon dates and isotope data that underpin the presently accepted “wiggle match” age reached a plateau (that is, stopped evolving normally). This meant that for several decades before the eruption, the outer growth rings of trees had ‘weird’ carbon ratios, forecasting the impending eruption. We re-analysed data from other major eruptions, including at Rabaul in Papua New Guinea and Baitoushan on the North Korean border with China and found similar patterns. The anomalous chemistry mimics but exceeds the Suess effect, which reversed the carbon isotopic evolution of post-industrial wood. This implies that measurements of carbon isotopes in 200-300 annual rings can track changes in the carbon source used by trees growing near a volcano, providing a potential method of forecasting future large eruptions. We anticipate that this will provide a significant focus for future research at supervolcanoes around the globe. At least two people have died in the magnitide 7.5 earthquake that struck New Zealand’s South Island early on Monday, local time. Preliminary modelling suggests that the earthquake was caused by a rupture of a northeast-striking fault that projects to the surface offshore. But this may be a complex event, involving several faults on the South Island. The northern part of the South Island straddles the boundary between the Pacific and Australian tectonic plates. The jostling between these plates pushes up rocks that create mountains including the Southern Alps and the beautiful Seaward Kaikoura Range, one of New Zealand’s most rapidly uplifting mountain ranges. The plate motion forces the oceanic crust of the Pacific plate beneath the Australian plate on thrust faults, and also causes the plates to slide laterally with respect to one another on strike-slip faults. The region affected by the recent earthquake has been one of the most seismically active in New Zealand over the past few years, including earthquakes that occurred as part of the Cook Strait earthquake sequence in 2013. It is likely that these sequences are related given their close spatial and temporal association. What slipped during the earthquake? The preliminary analysis strongly suggests that most of the energy release during this earthquake was sourced from the rupture of a roughly 200km-long fault system. This fault system is aligned northeast and dips to the northwest, beneath the northern part of the South Island. It coincides roughly with the subduction thrust in this area. The potential for large earthquakes on the subduction fault in the lower North Island and upper South Island of New Zealand was recently highlighted by GNS Science, New Zealand’s geological survey. It published evidence for two similar events in the Blenheim area roughly 520-470 years ago, and 880-800 years ago. Given its setting, this latest earthquake may be structurally complex, involving a mixture of plate boundary thrusting, lateral slip on strike-slip faults, and thrusting within the Pacific plate close to the epicentre, some 15km northeast of Culverden. The largest aftershocks suggest a mixture of thrusting and strike-slip movements. Because the fault system was large, and the earthquake apparently started at the southwest end of the fault and propagated to the northeast, the seismic energy was released over a period of up to two minutes. Large earthquakes produce more long period wave energy than smaller events. The 2011 Christchurch earthquake contained a lot of high-frequency energy and very strong ground accelerations, exposing more than 300,000 people to very strong to intense ground shaking. In contrast, this recent earthquake was manifested in Christchurch as lower-frequency rolling, and due to the sparse population density in the earthquake region, roughly 3,000 people in the upper South Island experienced strong ground shaking equivalent to the Christchurch earthquake. Reports are emerging of at least one major fracture in the ground surface that could be related to strike-slip faulting in the Clarence region. More traces may yet be found given the complexity of the earthquake. Tide gauge analysis will help to understand if a similar trace offshore caused the tsunami. The earthquake has also triggered liquefaction in coastal areas and in susceptible sediments, and landsliding of up to a million cubic metres along steep susceptible cliffs in the northern South Island. There are reports of extensive road damage including in the area between Hanmer Springs and Culverden, much of State Highway 1 and even Wellington, on the North Island. Most of this damage is probably caused by strong ground shaking, which causes weak ground to move en masse and has resulted in numerous slips and road closures in the central and northern South Island. Given the earthquake happened on the eve of a supermoon full moon, and the closest the Earth and moon will be since 1948, it wasn’t long before some tried to make a connection. But the tidal triggering of earthquakes has been investigated since the 19th century and remains a challenging and controversial field. Small amplitude and large wavelength tidal deformations of the Earth due to motions of the sun and moon influence stresses in Earth’s lithosphere. It is possible that, for active faults that are imminently close to brittle failure, small tidal force perturbations could be enough to advance rupture relative to the earthquake cycle, or to allow a propagating rupture to travel further than it might otherwise have done. But the specific time, magnitude and location of this or any other large earthquake has not been successfully predicted in the short-term using tidal stresses or any other possible precursory phenomenon. Deliberately vague predictions that provide no specific information about the precise location and magnitude of a future earthquake are not predictions at all. Rather, these are hedged bets that get media air time due to the romantic misinterpretation that they were valid predictions. Most earthquake scientists, including those that research tidal triggering of earthquakes, highlight the importance of preparedness over attempts at prediction when it comes to public safety. To this end, GNS Science uses a system of operational earthquake forecasts to communicate earthquake risk to concerned New Zealand residents during an aftershock sequence such as we are now entering. A normal aftershock sequence that is spread over the next few months. Felt aftershocks (e.g. M>5) would occur from the M7.5 epicentre near Culverden, right up along the Kaikoura coastline to Cape Campbell over the next few weeks and months. This aftershock sequence will probably (98%) include several large aftershocks (some greater than magnitude 6 have already occurred), and for each magnitude 6 aftershock we expect 10 more magnitude 5 aftershocks over the coming days and weeks. Of the many devastating pictures to come out of central Italy after last week’s deadly earthquake, the clock tower of Amatrice standing defiantly amid the rubble of the town has become an iconic image. The clock tower was reportedly built in the 13th century and its solid stance defies us to understand how this remarkable structure has evaded destruction at least twice in the past 800 years. But perhaps surprisingly, it’s not unusual for tall, ancient structures to survive earthquakes. Similar towers are relatively commonplace in Italy and part of the country’s charm. The town of San Gimignano, about 200km from the centre of the Amatrice earthquake, has 14 towers that date as far back as the 12th century – and have consequently survived many earthquakes big and small. Other towers can be seen in Alba in northern Italy. Further afield, a memorable image of the Izmit earthquake in Turkey in 1999 was of the tower of the Golcuk Mosque standing forlornly among the ruins. 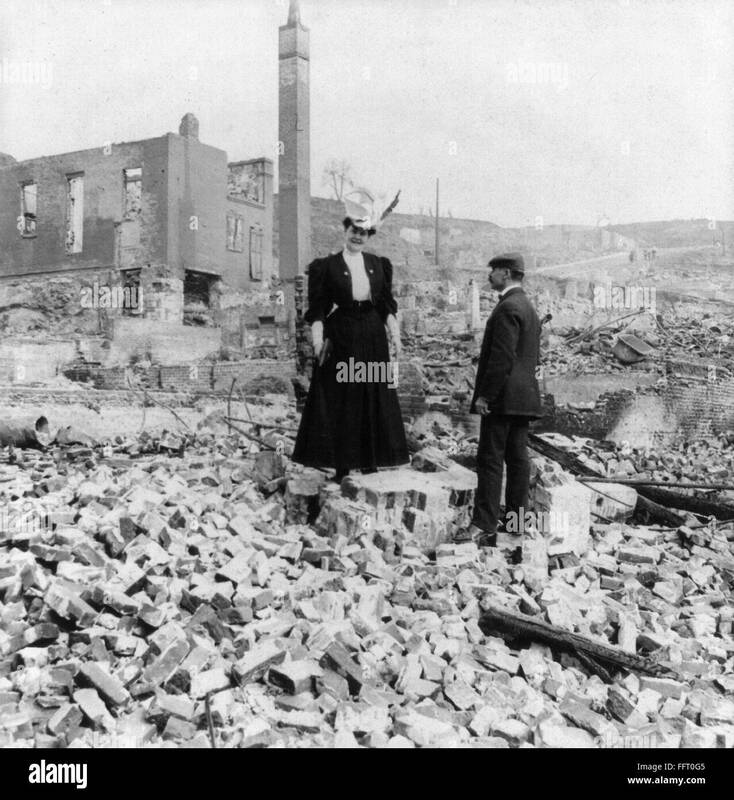 Photos from the 1906 San Francisco earthquake show a slender tower and an array of chimneys standing in the rubble of the city. In many instances, however, the towers fall, as happened to the Dharahara tower during the magnitude-7.8 Nepal earthquake in April 2015. 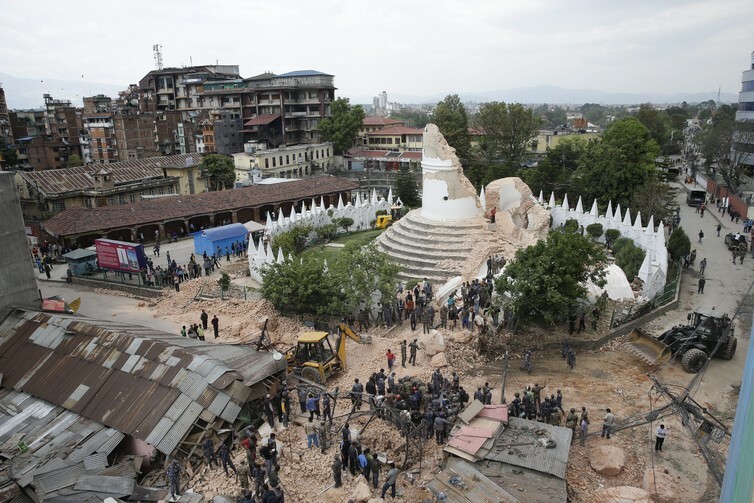 Why do some of these slender icons survive repeated earthquakes and others fall? An article in The Economist suggested that the clock tower was better constructed than the surrounding buildings, pointing out that it even survived better than a modern school and hospital. The L'Aquila experience suggests that this is probably one part of the story. However, the reality is more complex. Other factors can and do contribute to the resilience of buildings. It is very likely that the clock tower’s survival was influenced by the relationship between the frequency of the earthquake waves and the natural resonance of the building. To understand why, we have to consider how earthquakes interact with buildings. Earthquakes generate seismic waves that pass through the ground. Like ocean waves, they have peaks and troughs. The frequency of the wave is related to its “period” – the time taken for one complete waveform (including a peak and a trough) to pass. A building has a natural period that causes it to vibrate back and forth. Think of a child on a swing – a swing with short ropes will complete a full cycle much more quickly than a long swing. The same is true of buildings with different heights. A building is effectively an upside-down pendulum and taller buildings have longer natural periods of oscillation (swinging back and forth). The ground also has a preferred period at which it oscillates. Soft sediment in a river valley will oscillate over longer periods, and hard bedrock over shorter ones. High-frequency (short period) earthquake waves are therefore amplified in bedrock, such as the site of Amatrice, and are the dominant frequency radiated by small to moderate and shallow earthquakes such as last week’s. 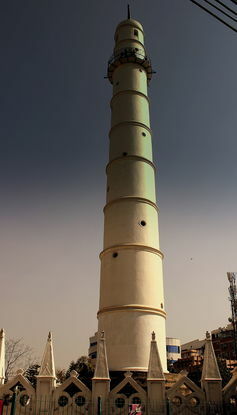 Low-frequency (long period) earthquake waves are amplified in sediment and form a greater part of the seismic energy radiated by larger earthquakes, such as the Tohuku earthquake in Japan and the Nepal quake that felled the Dharahara tower. When the resonant frequency of the ground coincides with the resonant frequency of the building, the structure will undergo its largest possible oscillations and suffer the greatest damage. The rigidity and distribution of mass along the height of a building also have a big effect on the likely damage sustained in a given earthquake, as this governs the way the induced forces are distributed. You can try this for yourself by experimenting with a broom handle and a 30cm ruler. Held vertically, the top of the broom handle will do little if you vigorously shake its base with small movements, whereas the ruler will oscillate under the same shaking. Slow the shaking down and the handle will begin to whip back and forth while the ruler settles down. Place a large mass on the end of either the ruler or the broom handle and the characteristics will change. The concept is beautifully demonstrated in a video by Robert Butler of the University of Oregon. Of course, real structures and real earthquakes are far more complex. Real structures have many natural frequencies, and earthquakes vibrate across a spread (or spectrum) of frequencies. Destruction occurs when any of a buildings’s natural frequencies coincide with any of the dominant frequencies of the earthquake. In some situations, there may be just a few structures that avoid this dangerous combination, such as the clock tower at Amatrice, or the chimneys of San Francisco. The characteristics of shaking at Amatrice have not yet been published, but it is highly likely that the tower is standing not only because it was built well in the first instance, but also because it is just the right size and shape to survive the frequency of shaking that occurs during Italy’s moderate-magnitude earthquakes. This process is equally important in other regions. The magnitude-6.8 Myanmar earthquake on August 24 damaged many historic temples in the Irrawaddy Valley, but none appears to have collapsed. These high-but-squat structures are susceptible to high-frequency shaking, whereas the passage of earthquake waves through alluvium is likely to have amplified mainly low-frequency earthquake waves. Notably, much of the damage to the temples seems to have occurred as a result of the collapse of recent cheap “restorations”. Building practices are extremely important in mitigating the effect of shaking on buildings. Modern buildings are commonly fitted with devices to reduce the effects of resonance. Engineered solutions are available to retrospectively enhance the performance of unreinforced masonry buildings, with little impact on their aesthetics. In Italy, this retrofitting needs to be done as quickly as possible before the next earthquake. This will be a costly exercise. Even apparently resilient medieval towers may require retrofits, because they have commonly accumulated a degree of damage. However, Italy is a globally important cultural and tourism hub, and her earthquake-prone buildings, like those in Myanmar, are part of our collective heritage. Italy should not be left to struggle alone with the management of earthquake-prone building hazards. The Appenines region of central Italy has been struck by a deadly earthquake, with a magnitude of 6.2. The quake, which had an epicentre roughly 10km southeast of Norcia, Italy, occurred just over seven years after the 2009 L'Aquila earthquake that killed more than 300 people only 90km away. The latest earthquake occurred at 3:36 am local time. The number of fatalities is unknown at time of writing but already exceeds 100. Buildings have collapsed in nearby Amatrice and residents are reportedly trapped in rubble. This earthquake is no surprise. 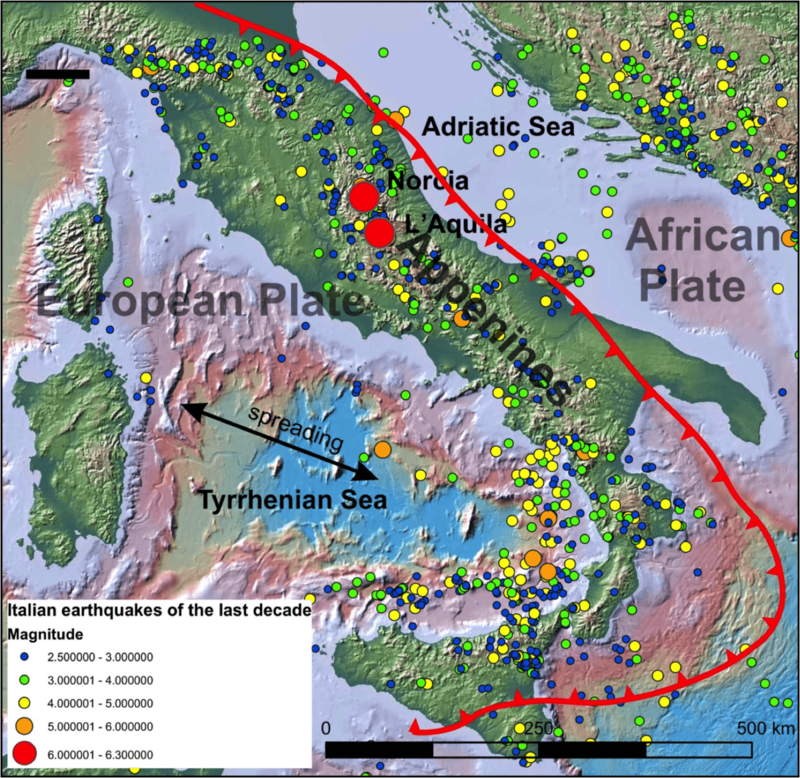 Italy is prone to earthquakes; it sits above the boundary of the African and European plates. The oceanic crust of the African plate is subducting (sinking) under Italy, creating iconic natural features such as the volcano at Mount Vesuvius. These plates are converging at a rate of around 5mm each year. Both the L’Aquila and Norcia earthquakes were located below the central Appenines, which form the mountainous spine of Italy. The Earth’s crust under the Appenines of central and western Italy is extending; eastern central Italy is moving to the north east relative to Rome. As a result, this region experiences normal faulting: where one part of the earth subsides relative to another as the crust is stretched. The fault systems in the central Appenines are short and structurally complex, so the earthquakes are not large by global standards, the largest almost invariably hover around magnitude 6.8 to 7.0. But because the quakes are shallow and structurally complex, and because many of the local towns and cities contain vulnerable buildings, strong shaking from these earthquakes has the potential to inflict major damage and loss of life in urban areas. This region also seems to be particularly prone to earthquake clustering, whereby periods of relative quiet are interrupted by several strong earthquakes over weeks to decades. Both Norcia and L’Aquila feature prominently at either end of a zone of large Appenine earthquakes. This zone has produced many strong earthquakes. The latest Norcia earthquake occurred only around 90km northwest of the L’Aquila earthquake and very close to the epicentre of the 1979 Norcia earthquake, which had a magnitude of 5.9. But the area’s earthquake history can be traced back over seven centuries. During this period, this region has been hit by at least six earthquakes that have caused very strong to severe shaking. Amatrice, so badly damaged in the most recent quake, was severely damaged in 1639. A few decades later, in 1703, roughly 10,000 people were killed in Norcia, Montereale, L’Aquila and the surrounding Appenine region in three magnitude 6.2-6.7 earthquakes. Parts of Norcia were subsequently built upon the surface rupture created in the 1703 earthquake. Another earthquake in 1997 killed 11 people. In this most recent event, an estimated 13,000 people would have experienced severe ground shaking, probably lasting 10-20 seconds. 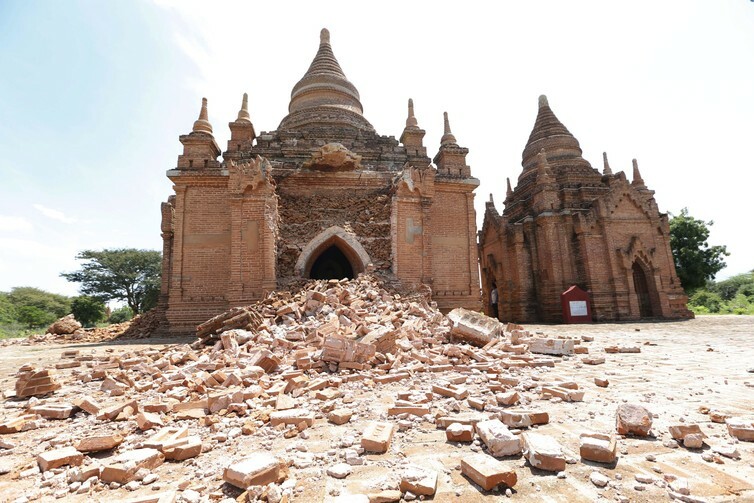 The estimated damage of this latest earthquake will almost inevitably exceed US$100 million, and may top US$1 billion. Amatrice appears to be among the populated areas that were most severely affected. The region now faces a prolonged and energetic aftershock sequence; over the first 2.5 hours following the mainshock, at least four earthquakes of around magnitude 4.5 were recorded in the region by the US Geological Survey. More than 10,000 aftershocks were recorded following the L’Aquila earthquake in 2009. We note that within the region, there is excellent and continuously improving scientific information about the hazard. But the knowledge of the hazard has not always translated well into measures that directly reduce economic loss and fatalities in earthquakes. Following the L'Aquila earthquake, six scientists were convicted of manslaughter for failing to inform the public adequately of the earthquake risk. Although the charges were subsequently dropped, this marked a major development in the way blame is apportioned after large natural events, particularly with regard to effective hazard communication. Numerous vulnerable buildings remain, and the recovery process is commonly plagued by long disruptions and inadequate government funding to recover rapidly. Both the 2009 L’Aquila earthquake and this most recent quake highlight just how important it is to translate hazard assessments into improving the resilience of infrastructure to strong shaking. The focus should remain on linking science, engineering and policy, this is often the biggest challenge globally. Most people in western society drive. Drivers are taught and required to be hazard aware. They are required to pay attention and can be severely penalized for failing to do so. Most people, drivers or otherwise, work for a living, and the terms of their employment require them to be hazard aware. Failure to work within health and safety regulations can result in dismissal. Driving and working generally don’t account for more than 40% of a person’s life. So, what else do we do? Some of us get closer to nature. Most people – drivers, workers or others – spend some time in outdoor recreation, whether on the beach, at the pool, on the bike, or somewhere else. In outdoor activities it is pretty unwise, and possibly even catastrophic, not to pay at least some attention to potential hazards. Beaches can kill not just by drowning but by heat-stroke or due to recklessness of another beach-goer. Recklessness that causes a hazard to others is seriously frowned on and may be illegal. We plan for hazards almost automatically as we pack our picnic and throw in the antihistamines and first-aid kit. So, what do we do when we are not working, driving or spending time outdoors? We sit on the couch and watch television, play on mobile phones, drink cups of tea and the occasional beer, and sleep. No hazards here we think. But are we right? In the other settings where we live out parts of our life we are warned about the hazards repeatedly. The road toll, the drowning toll, work accident data on big display boards. Occasionally we hear of accidents in the home, but to most people, our homes are our castles, and sometimes the rates might feel that way too. Just remember, you spend up to 50% of your life in your home, so the chances are reasonable that your castle is where you will be during the next earthquake. In order to plan for seismic hazard, and understand what to have in your seismic-aid kit, you need to have some idea of what you are dealing with. Google map showing the original interpreted location of the earthquake, just near Lake Coleridge. As you can see, over the ensuing hours the earthquake location and magnitude were both revised. Although the revised location is closer to the Alpine Fault, the reduced magnitude reduces the area-wide influence of this single event. This morning 6th January 2015, at 06.48 am, an earthquake of M~6 shook the Southern Alps of New Zealand (see Geonet record here). It provided a nice example of the intricacies of earthquake science, and the need for the media and scientists to keep a fluid mindset in the first few hours after an event. Too much speculation soon after an event is nothing more than that - SPECULATION. I have long wished for a good novel with a geo-hero, preferably somewhat believable. Now I find that Sarah Andrews is the person I have been looking for. Sarah holds an MS in geology, having researched uranium deposits in alluvial fans and worked in the oil industry. She uses geological settings as a framework for her novels, and provides easy-reading education for the public about geology and geologists. Long may she continue!